Be the first to share your favorite memory, photo or story of Erwin . This memorial page is dedicated for family, friends and future generations to celebrate the life of their loved one. 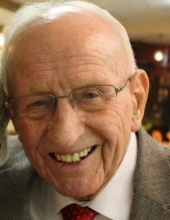 Erwin O. Witte was born to eternal life on April 5, at the age of 91 at Harbor Cove in Port Washington. Erwin, who was known as Erv, was born on Nov. 30, 1923, in the Town of Grafton, the son of William and Alma Hahn Witte. His family later moved to Waubeka where he attended the local school and church until he moved back to Grafton to work on a farm. At the age of 22 he was drafted into the United States Army where he served almost two years stateside at the end of World War II. While in Grafton, Erv met the love of his life, later marrying Marian Tetzlaff on Nov. 15, 1947 at St. John’s Lutheran Church in Lakefield. Both Erv and Marian were proud and grateful to celebrate 67 years together. Their marriage was blessed with a son, Erwin Jr. (Virginia) Witte and two daughters, Diane (David) Robishaw and Nancy (Henry) Freier. Erv was very close to them all. Erv worked at Fromm Laboratory in the Town of Grafton for 34 years and was able to happily retire at the age of 60. He lived in Grafton, Cedarburg, West Bend and finally, Port Washington. Erv and Marian were able to enjoy traveling to Europe in 1979 and 1983. When Erwin wasn't spending time with his family, he was happiest in the garden. He became especially fond of his hosta garden in Jellystone Park in Fort Atkinson, where he and Marian had a summer home for 19 years. As the years went by, Erv’s family continued to grow. He had seven grandchildren: Stacy (Peter) Becker, Kimberly (Mike) Schmit, Kevin (Melissa) Freier, Cindy (Kahlin) Taylor, Trista Robishaw, Trevor (Kati) Robishaw and Mackenzie Witte. Erv was so proud of his large growing family. He was blessed with 11 great grandchildren: Michael, Bradley, Onnika, Conner, Emma, Claire, Sophia, Brennen, Haeley, Kinslee and Levi. He is also survived by his two sisters, Caroline (late Carl) Wilde and Eleanor (late Ed) Wilde and brother-in-law, Herm (Doris) Tetzlaff. A celebration of Erv’s life will be held at St. John Lutheran Church in Grafton, at 2 p.m. Saturday, April 18. Visitation will take place prior to the funeral service at St. John Lutheran Church from 11 a.m. to 2 p.m. Pastor Jim O'Reilly-Christensen will officiate the service. Burial of the cremains will take place directly after the service at Lakefield Cemetery, Grafton. A lunch will be served in the fellowship hall after. To send flowers or a remembrance gift to the family of Erwin O. "Erv" Witte, please visit our Tribute Store. "Email Address" would like to share the life celebration of Erwin O. "Erv" Witte. Click on the "link" to go to share a favorite memory or leave a condolence message for the family.